The world split open / Louise Bernikow. "The world split open" is the title of a new anthology of women's poetry. In this program, Joan Larkin talks with Louise Bernikow, editor of the anthology. 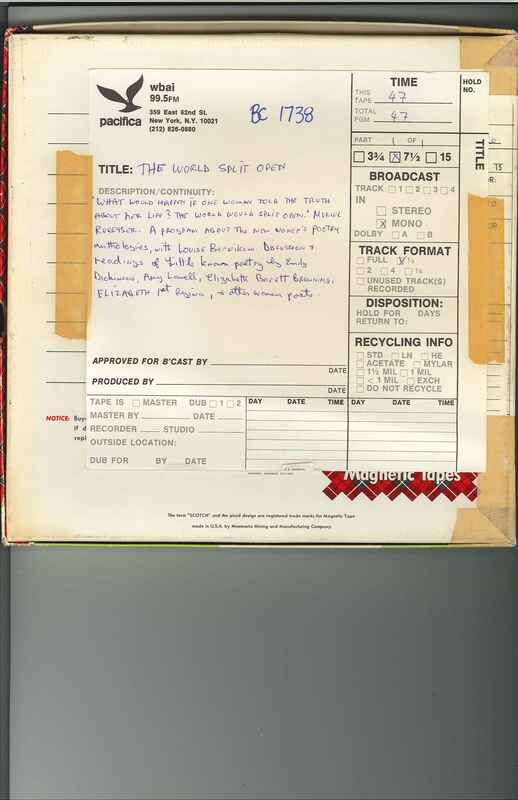 Program includes some of the poetry included in the anthology, recorded May 13, 1972 at WBAI at a Women's poetry reading, also entitled "The world split open". The readers, poets themselves, are Louise Bernikow, Muriel Rukeyser, Sonja Sanchez, Odetta, Jackie Weiden, and Honor Moore. Includes readings of little known poetry by Emily Dickinson, Amy Lowell, Elizabeth Barrett Browning, Queen Elizabeth I and other women poets. The program was produced by Joan Larkin and Brett Harvey Vuolo.